There are at least, two Danawanons that I know living and working near the top of the world. One is a woman from Barangay Langlang, Rose Barriga-Jonsson. She lives and works in Iceland. There could be more – maybe in Northern Alaska too or Norway. Danawanons are just everywhere in the world. Raul is the son of the late Noy Ramon and Nang Lalay Gonzales of Poblacion. Their house is located at the Corner of Bonifacio and F. Ralota Streets, just across the Danao Central School and a block away from the church. My cousin and friend Fr. Henry Bascones, currenlty a parish priest in High Level, Alberta told me about Raul, being there up far north in Yellowknife about 9 hrs. drive from his parish. 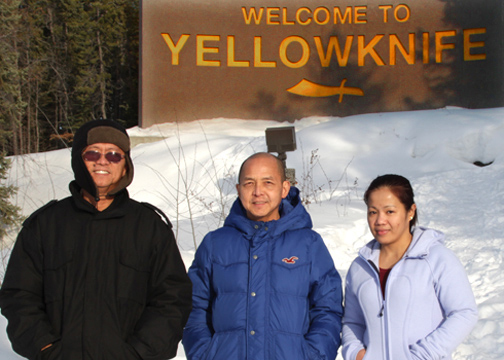 Then during the Holy Week I had an opportunity to travel far north of Canada and having a good feel of a very cold winter on springtime in Yellowknife. So on Tuesday after Easter, I bundled up, at least 4 layers – wore a winter hat – double socks and a pair of winter boots for me to comfortably walk in the snow and meet Raul at his house, just two blocks from where I was staying. For local residents, like Raul, a temperature of -10°C is nice – they can be wearing lighter than their usual heavy winter get up that protect them from the usual winter chill at -30°C up to -50°C, which I still have to experience. (That must be at least 3 times more freezing than the freezer at Magnolia). Raul related that he came to Canada in 2001 as an immigrant because his first wife insisted she could not raise their daughter by herself. He was an accountant at the William Lines when he left Philippines and came to Hay River, Northwest Territory, Canada and worked in a grocery store. In less than two years at Hay River, Raul and his wife were separated, filed for a divorce while he retained full custody of their only child. Then he moved farther north to Yellowknife. The small city capital of the Northwest Territory has recently been experiencing a booming economy after the discovery of diamond in the early 1990s and the entry of the world’s top players in the diamond mining industry. Yellowknife is popularly known as America’s Diamond capital and considered the world’s third largest diamond producer. Raul then applied to work in one of the 3 mining companies operating about 300 miles north of Yellowknife and got his starting job as a company kitchen helper. But he did kitchen work for only a very short time, because he kept on applying whatever positions that open up until he passed a tough screening for a much better paying job as a tool keeper and warehouseman at the Diavik Diamond Mine. As a full time employee, Raul as well as most of the employees only work two weeks and get a 2-week vacation. Every two weeks Raul takes the company airplane to the work site and is flown back to Yellowknife for the 2-week break. Employees are provided a comfortable living accommodation and free meals at the worksite’s dining hall. According to Raul aside from a handsome pay, employees are also given the opportunity to buy at 25% discount a maximum of 3 carats diamond every year. THE case of Fr. 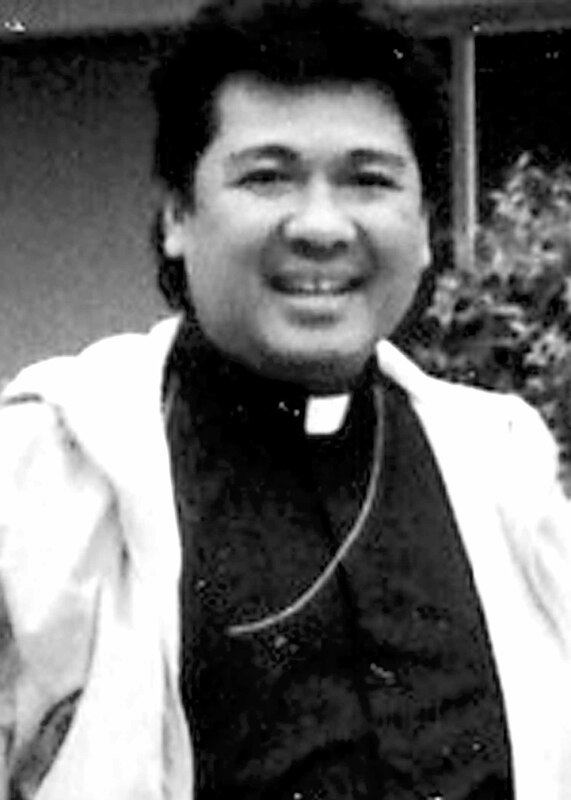 Jonathan Lao of the St. James the Apostle parish in Compostela town should be intriguing not only for the Cebu archdiocese but more so to the province’s Catholic faithful who are not used to priests professing views that do not hew to tradition. Lao recently instituted in his parish changes to the “Sugat” practiced by Cebuano Catholics for decades by taking the spotlight away from the Virgin Mary in the narrative of Jesus’s resurrection. He insisted on using the “biblical version” that has Mary Magdalene discovering the empty tomb and seeing the risen Christ first. The move is interesting because it seems to be in keeping with earlier complaints by the parishioners about Lao downplaying the importance local Catholics place on the worship of Virgin Mary and the saints, including the Sto. Niño. Meaning, he sounds consistent with his interpretation of the gospel. Cebu Archbishop Jose Palma earlier quoted Lao as saying he is a “graduate of Rome,” which is not unlike claiming superiority in theological studies over other priests not similarly situated. This seems to have given him the daring to be “different” as a parish priest. What is puzzling is that Lao was not reported to have exhibited the same maverick streak in his previous assignments. These same complaints were not heard when he was chaplain of the Colegio de San Antonio de Padua in Danao City last year until his transfer in September. He was accused of shooting a student who was allegedly trying to steal mangoes in the school compound. The case was settled amicably, but not before he was detained by the Danao City Police Office. But levity aside, the archdiocese should not tarry in resolving the controversy stirred by Lao as a parish priest. His maverick views strike at the age-old beliefs and practices of Cebu’s Catholics and spark confusion instead of enlightenment, at least among his parishioners. The Catholic Church hierarchy is feudal in structure and prides in the unity of its interpretation and teachings of the gospel. Having a maverick in its midst is always frowned upon. So when will the archdiocese move to solve the Lao question. Published in the Sun.Star Cebu newspaper on April 10, 2012.